Maimeri water-based picture varnish may be used with acrylic or oil painting as an alternative to traditional solvent varnish. 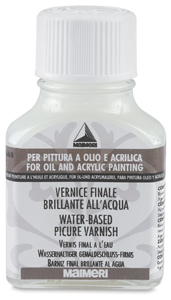 Easy to apply, it enhances the brightness of colors and won't yellow with age. It's housed in a glass bottle with twist-off cap.